Saudi Arabia on Friday bluntly rejected U.S. appeals for improved relations with Israel as a way to help restart Middle East peace talks, saying the Jewish state is not interested in a deal. 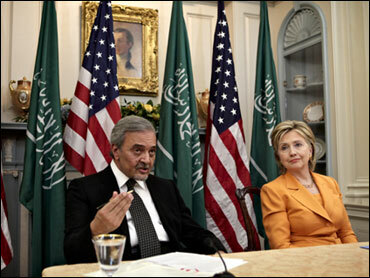 After talks with Secretary of State Hillary Rodham Clinton, Saudi Foreign Minister Prince Saud al-Faisal said his country will not consider steps suggested by U.S. Mideast peace envoy George Mitchell until Israel accepts Arab demands to withdraw from all occupied Palestinian territories. "Incrementalism and a step-by-step approach, has not and, we believe, will not lead to peace," Saud said as Clinton looked on at a joint State Department news conference. "Temporary security and confidence building measures will also not bring peace." "What is required is a comprehensive approach that defines the final outcome at the outset and launches into negotiations over final status issues," the prince said, referring to the borders of a future Palestinian state, control of Jerusalem, the return of Palestinian refugees, water and security. President Barack Obama, Clinton and Mitchell all have been urging Arab nations to improve ties with Israel with confidence-building measures such as opening trade offices, allowing academic exchanges and permitting civilian Israeli aircraft to overfly their airspace as a way of demonstrating their commitment to peace. Clinton repeated that call in her remarks, saying the Obama administration wants "the Arab states, including our friends in Saudi Arabia, to work with us to take steps to improve relations with Israel, to support the Palestinian Authority and to prepare their people to embrace the eventual peace between the Palestinians and the Israelis." "Saudi Arabia's continued leadership is absolutely vital to achieve a comprehensive and lasting peace," she said. But Saud flatly rejected such steps. He maintained that Israel was trying to distract the world from a Saudi-proposed Arab-Israel peace deal in which Arab states would recognize Israel provided it withdraws from Arab territory seized in the 1967 war. "The question really is, What will Israel give in exchange for this comprehensive settlement offer?" Saud said, noting that Israeli Prime Minister Benjamin Netanyahu has ignored U.S. calls to stop constructing Jewish settlements in the West Bank and building housing in East Jerusalem. "Israel hasn't even responded to an American request to halt settlements, which President Obama described as illegitimate," he said. The Saudi stance is complicating Mitchell's efforts to bring the Israelis and Palestinians back to negotiations. But Clinton denied that the odds were insurmountable. She said Mitchell, who just returned from his fifth trip to the region, was making progress and developing a formula to get the two sides talking again. "We feel like we're making headway and we are determined to do so in as short a period of time as possible," she said.